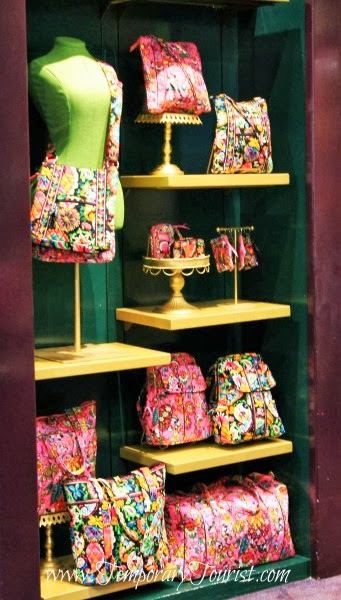 Are you a Vera Bradley fan? I have been one for many years. I have a monogrammed "Hope" backpack that was the design of the year for Breast Cancer Awareness. It's a favorite of mine for park touring. It's pretty in pink, lightweight (before I load up my camera gear) and washable. The Release Party for the Disney Collection by Vera Bradley which is made exclusively for Disney Parks is set for tomorrow Saturday September 21st. The event will begin at 7:30 a.m. in the World of Disney at the Downtown Disney Marketplace at the Walt Disney World Resort. 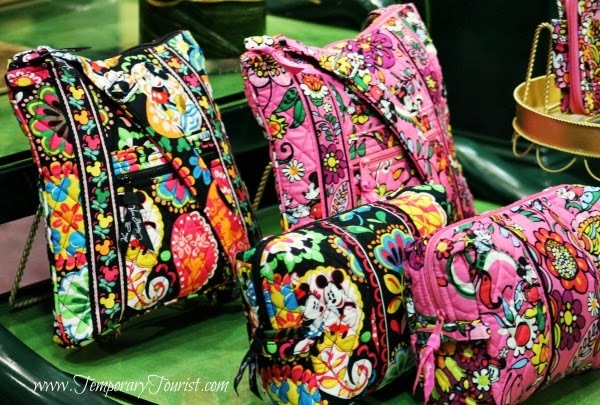 My dear Disney Blogging friend Aunesty from The Temporary Tourist was very kind to share with us a sneak peek at the new bags that she was able to snap pictures of earlier today. Oh how I wish I had been with her to get a close-up look at the new collection. I like many other fans will have to wait till the collection is sold online starting in late October 2013. Featuring “Just Mousing Around” and “Midnight with Mickey”. 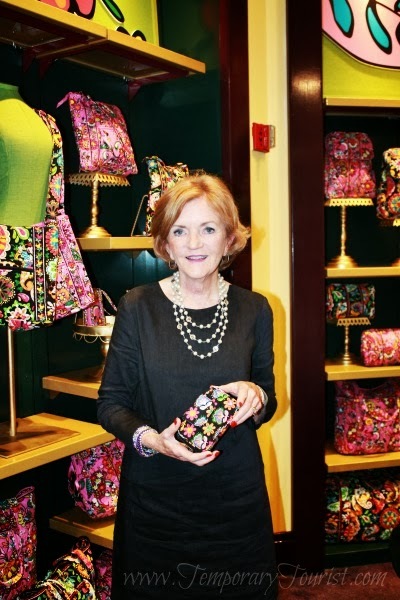 Saturday, Barbara Bradley Baekgaard, Vera Bradley Co-founder and Chief Creative Officer, will be attending the Release Party. Barbara will be doing a meet and greet from 8:00 a.m. to 9:30 a.m. There will be a limited number of wristbands given out to guests for the meet with Barbara. They will be distributed on a first come, first serve basis to guests who make purchases that morning. If you are planning on attending this event please make note that parking for Downtown Disney Marketplace will begin at 3:00 a.m. There will be a designated queue outside World of Disney starting at 4:00 a.m. There will be purchase limits for September 21 - 22, 2013. 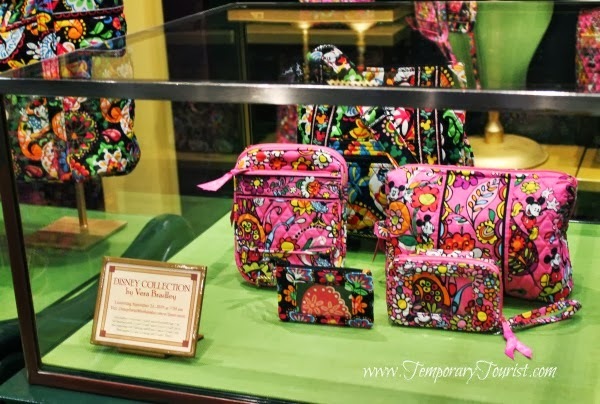 Guests will be allowed one (1) of each style of the Vera Bradley bags in the “Just Mousing Around” collection (8 styles total) and one (1) of each style of Vera Bradley bags in the “Midnight with Mickey” collection (8 styles total). While supplies last. Subject to change without notice. Starting on Monday, September 23, the purchase limits will change to two (2) of each style of Vera Bradley bags in the “Just Mousing Around” collection (8 styles total) and two (2) of each style of Vera Bradley bags in the “Midnight with Mickey” collection (8 styles total). While supplies last. Subject to change without notice. Kristen J. will be receiving her backpack from the new collection shortly.